While Mr. Rescue Plumbing & Drain Cleaning intends that the information, content, products, and functions available herein be as accurate and up-to-date as possible, Mr. Rescue Plumbing & Drain Cleaning does not guarantee or warrant the accuracy, adequacy, completeness, or reliability of the information, content, functions or products displayed, performed, downloaded or otherwise available herein. Nor does Mr. Rescue Plumbing & Drain Cleaning warrants that your access to the website will be uninterrupted or that the material accessible from this website is virus-free. THE INFORMATION ON THIS SITE IS PROVIDED "AS IS." TO THE MAXIMUM EXTENT PERMITTED BY APPLICABLE LAW, THE COMPANY DISCLAIMS ALL WARRANTIES, EITHER EXPRESS OR IMPLIED OR OTHERWISE, INCLUDING, BUT NOT LIMITED TO, IMPLIED WARRANTIES OF MERCHANTABILITY, FITNESS FOR A PARTICULAR PURPOSE, TITLE AND NON-INFRINGEMENT, WITH REGARD TO SUCH INFORMATION. TO THE MAXIMUM EXTENT PERMITTED BY APPLICABLE LAW, IN NO EVENT WILL THE COMPANY BE LIABLE FOR ANY SPECIAL, INCIDENTAL, INDIRECT, CONSEQUENTIAL OR PUNITIVE DAMAGES WHATSOEVER INCLUDING, WITHOUT LIMITATION, DAMAGES FOR LOSS OF USE, DATA OR PROFITS ARISING OUT OF OR IN ANY WAY CONNECTED WITH THE USE OR PERFORMANCE OF THIS SITE OR ANY LINKED SITES WHETHER BASED ON CONTRACT, TORT, NEGLIGENCE, STRICT LIABILITY OR OTHERWISE EVEN IF THE COMPANY HAS BEEN ADVISED OF OR SHOULD HAVE KNOW OF THE POSSIBILITY OF SUCH DAMAGES. BECAUSE SOME STATES AND JURISDICTIONS DO NOT ALLOW LIMITATIONS ON HOW LONG AN IMPLIED WARRANTY LASTS OR THE EXCLUSION OR LIMITATION OF INCIDENTAL OR CONSEQUENTIAL DAMAGES, THE ABOVE LIMITATIONS AND EXCLUSIONS MAY NOT APPLY TO YOU. Unless otherwise indicated, this website and its contents are the property of Mr. Rescue Plumbing & Drain Cleaning and are protected, without limitation, pursuant to U.S. and foreign copyright laws. Reproduction of any part of this site, its design, content, and source code is prohibited without the express written permission of Mr. Rescue Plumbing & Drain Cleaning .By submitting any material or photographs to this website, you are granting permission for us to post this material on our website. You are representing that you are the rightful owner of the submitted material, and that no one else may claim rights to this material. We reserve the right to remove access to infringing material. The source code, design, content, material, images, information, template, style of this website www.mrplumbingdraincleaning.com is protected by United States Copyright Law. The copy or taking source code, design, content, material, images, information, template, style from this website is prohibited and can result in legal action. Mr. Rescue Plumbing & Drain Cleaning reserves the right to change, at any time, at our sole discretion, the Terms under which these Services are offered. You are responsible for regularly reviewing these Terms. Your continued use of the Services constitutes your agreement to all such Terms. This site may include links to franchisee and other Internet sites. Mr. Rescue Plumbing & Drain Cleaning has not and cannot review all material made available through websites linked or linking to any part of this site. Mr. 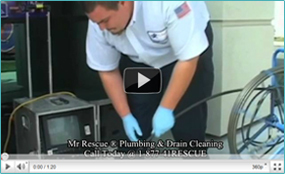 Rescue Plumbing & Drain Cleaning is not responsible for the content of such sites. These links are provided as aids to help you identify and locate resources that may be of interest to you, including sites of franchisees. Links to non-franchisee sites are not intended to indicate or imply that the Mr. 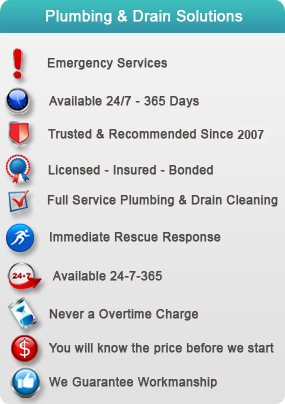 Rescue Plumbing & Drain Cleaning sponsors or is affiliated or associated with linked sites. Mr. Rescue Plumbing & Drain Cleaning bears no responsibility or liability for any content or harm arising from your use of a third-party website. These Terms are governed by the laws of State of California, without regard to the rules of conflict of law that may cause the laws of another jurisdiction to apply. You agree to the sole and exclusive jurisdiction and venue of the federal or state courts of the State of California in the event of any dispute of any kind arising from or relating to your use of the Site. Mr. Rescue Plumbing & Drain Cleaning disclaims all responsibility and liability for the availability, timeliness, security or reliability of the Services or any software provided through the Services. Mr. Rescue Plumbing & Drain Cleaning reserves the right to modify, suspend, or discontinue the Services or access to the Services without any notice at any time and without any liability to you.